Manufactured in accordance with British Telecom CW1308 specification but the insulation and sheath compounds have been changed to low smoke zero halogen (LSZH) thermoplastics to remove any poisonous halogens gas in the event of a fire. 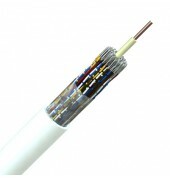 Solid copper conductor, coloured core identification Low Smoke Zero Halogen insulation, twisted into pairs, ripcord, Low Smoke Zero Halogen jacket, white. Earth core in cables with 10 pairs or more.